Additional Info: Coffee Machine, Sandwich Toaster, Outside Tap & Hose, Comprehensive inventory including some everyday essentials. Bookings MON - FRIDAY AND FRIDAY - MON BREAKS AVAILABLE. Specific requirements for dates may be accommodated please enquire within. 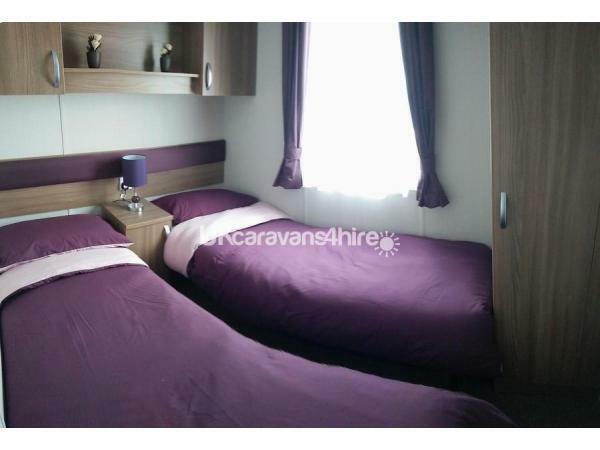 At the time of booking we require a security deposit of £75, which is refundable within 14 working days of you leaving the caravan undamaged and in a clean, presentable condition. This will also secure your booking, however this is non-refundable on cancellation within 6 weeks. Cancellation within 3 weeks will incur 50% charge. 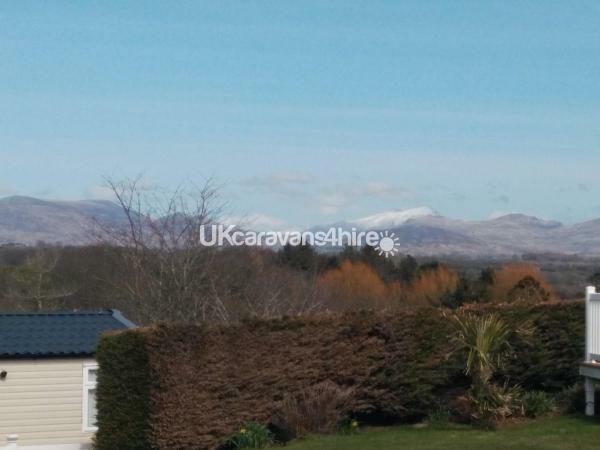 The caravan is sited on the Hafan Y Mor, Haven holiday park, located on in a quiet corner of the park on Mountain View, which makes an idyllic setting to relax and unwind. This location also allows a safe playing area for children in addition to the lockable gated decking area. 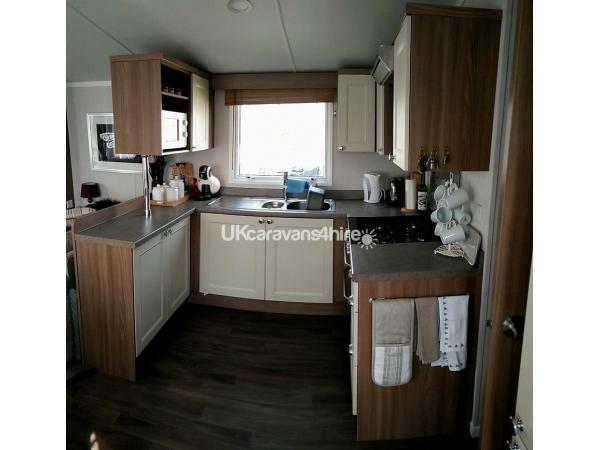 This 'Platinum' Spec kitted out caravan is rated through the Haven classification as a ‘Prestige’ model (with decking) with many additional touches to make this a true ‘Home from Home’. Our van comes fully Equipped with double glazing and central heating throughout. In addition a living flame fireplace adds warmth and ambience to the lounge area. 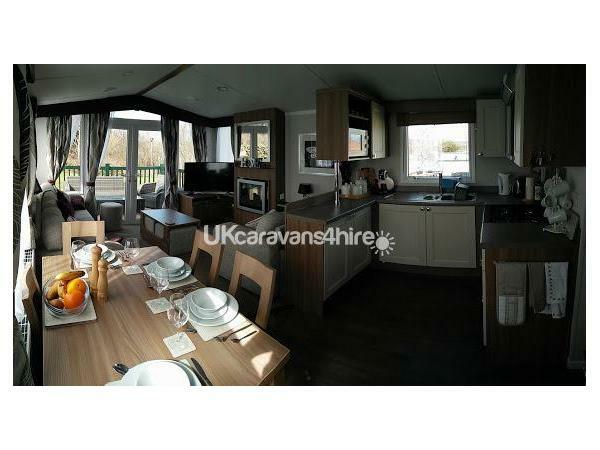 The caravan sleeps 6+2 (8max). It has 3 bedrooms, one double and two twins, each with plenty of cupboard and wardrobe space. 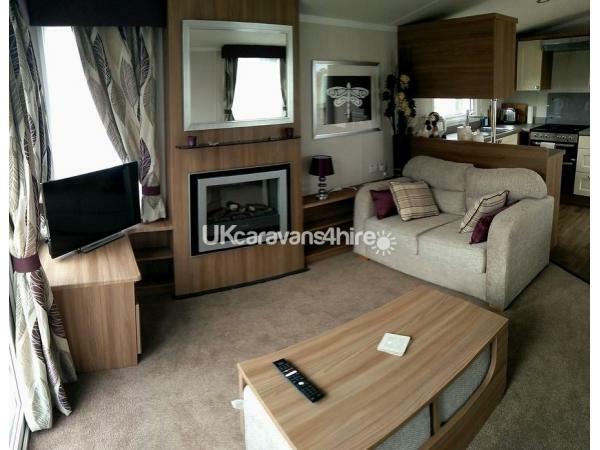 The (+2) second double bed is a sofa style bed located in the lounge area. There is a main bathroom with shower, toilet and basin and the main bedroom also benefits from an en-suite toilet/basin. For entertainment there is a 43" TV with Freeview TV and DVD player in the lounge, and a 28” tv in the main bedroom also with Freeview. In the lounge/dining/kitchen area you can make use of the built in Bluetooth sound system, easily connecting to all your Bluetooth devices. A selection of games/books/dvds etc are also provided to help those evenings in rainy days pass by. A fully equipped kitchen is provided and includes a microwave, kettle, toaster, sandwich maker, coffee machine (Dolci Gusto), crockery, cutlery, glasses and mugs along with cooking utensils, pots and pans. Also there is a built-in fridge with separate freezer and a full gas cooker, grill and oven with extractor hood. 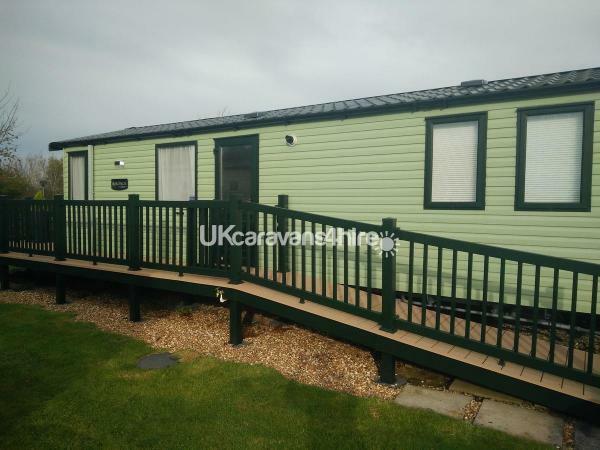 Outside we have a wraparound decking with a gated ramp access from the parking bay. 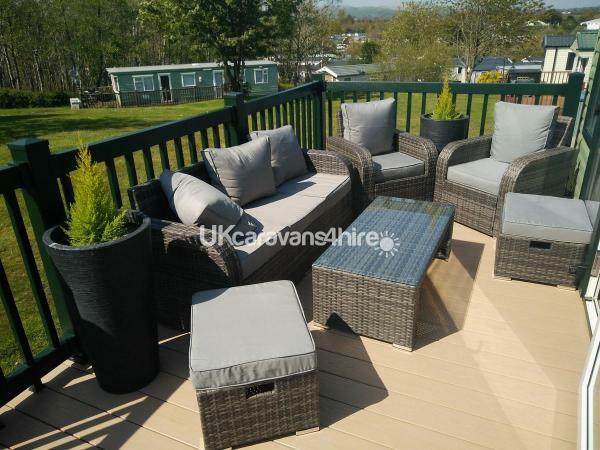 The decking is also accessible from the lounge area French doors, which, supplied with rattan outdoor seating is ideal for a coffee or al-fresco dining. This also leads down to the lawned area behind the van. The property has an off road parking spot and a secure metal lockup suitable for upto 4 cycles and an outside tap/hose to rinse off those muddy boots n bikes. No Haven Check in queues, paperwork will be provided for immediate check in/Site access then direct to the van! PLEASE NOTE: Haven FunWorks passes are required to enter any of the entertainment venues and swimming pool area. Available prior to or at check-in priced approx £25-45pppw adults/£13-25 child, these are not included in this booking. Can be booked via us (same price) or you can prebook by calling the park direct on 01758 612112. Additional Info: As for the site, its great for the family, swimming pool (slides/rapids/flumes etc), golf (mini and full 9 hole course), entertainment venues (bar/club/live acts etc), activity center (high ropes, segways, nature activities, archery, shooting, fencing, trampolines, gym etc etc etc). The coastal path and beach are a short 10 min walk away and are ideal for walks biking etc. The onsite nature ranger often provides activity's based in the woodland, around the lakes and coastline. The entertainment venues, of which there are several, have live entertainment for all the family. Arcades, gift shops, supermarkets and even a pub serving food (similar to a weatherspoons). Other food options onsite, Papa Johns (inc delivery to van), Millies Cookies, Burger King, Starbucks and a Fish and Chip take away! This place is short of nothing!. My husband and I with our two girls aged 3 and 7 have just returned from an amazing Easter break at this caravan in haven. As soon as we arrived this caravan stood out from the rest for all the right reasons. 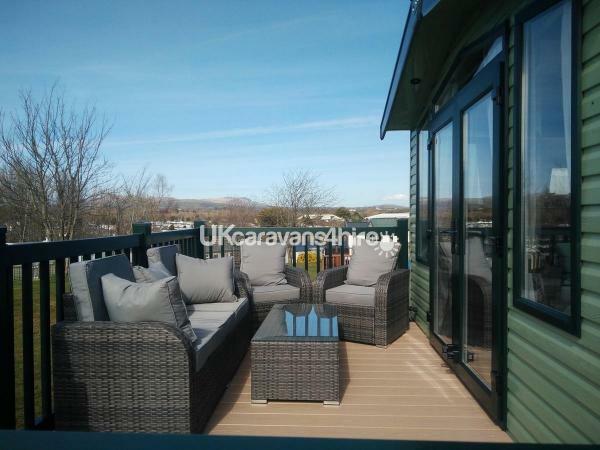 It is new with spectacular views of the Welsh mountains, it is in a lovely quieter location on the site which is private and has a beautiful outdoor space just in front of the decking seating so myself and my husband could watch our girls explore safely whilst we had a coffee and a sit outside. We instantly felt at home the inside space is so cosy. 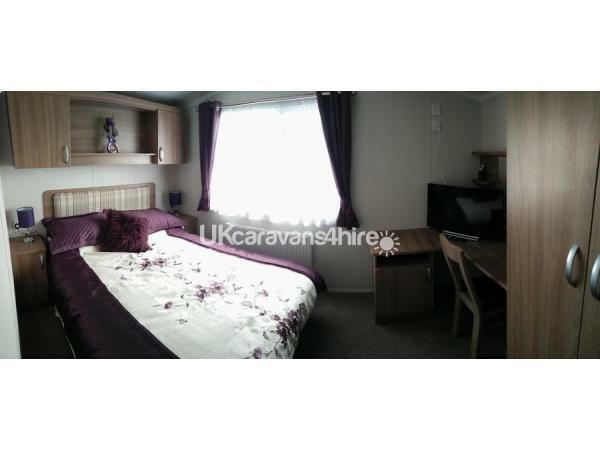 It is a perfect distance just a short walk from local beach and the haven activity complex. The luxury of having a dining table inside the van meant we could have evening meals together as a family and space for the girls to draw/ Play board games with lots of extra seating and pull out tables which were put to good use. We will definitely return and would like to thank Simon and Lisa for allowing us to stay. Wow, thanks for your kind words, we love our time here and glad we could share our home from home with you too. Thanks for looking after our caravan and your welcome back anytime soon. 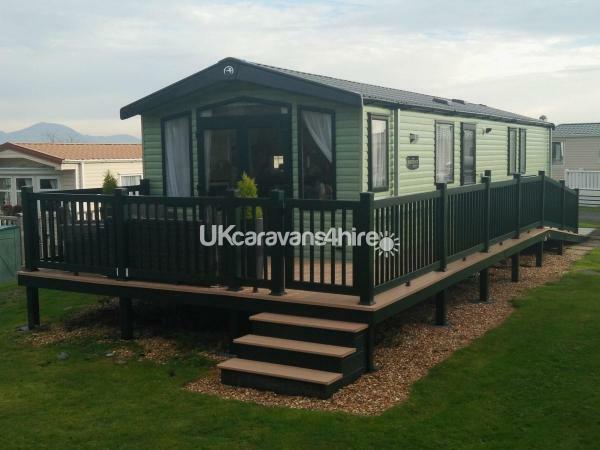 We had a fabulous holiday in this lovely caravan. All bedrooms were clean, and the extra bedding that we booked made holiday life even easier! The living room is spacious with lots of lovely homely touches. The decking area has a lovely view with comfortable outdoor furniture to relax on after a busy day in the park. My little boy loved it that much he’s determined that we relocate to Wales to live in a caravan. Simon was very helpful and nothing was too much. Thank you for providing us with a lovely place to stay for our holiday! Thank you Jennifer for your kind words, you and your son are welcome back anytime. Sounds like you will have trouble keeping him away. Thanks Jane, glad to hear you enjoyed your stay and thanks for the review. We had a fantastic holiday in this excellent accommodation. The facilities on the site are very good for children of all ages. The beach is in easy walking distance and we also enjoyed visiting Pwllheli and Criccieth too. This is a super place to stay and explore the Llyn peninsula. Thanks for your lovely words Cathy, glad you enjoyed your stay, you're welcome back anytime ???? Thanks Neelam for your kind words, glad you enjoyed your stay, hope to see you again soon. Had a lovely week staying in Simon’s caravan! It’s a lovely space, very homely and relaxing. The location in the park is great - a short walk to the complex but far enough away to be quiet. My three year old managed the walk fine and even made us stop off at the wigwam in the woods most days! The view from the window overlooking the mountains is just gorgeous. Simon was really helpful when we booked - he was very patient with my tonnes of questions and was really prompt in sending us all we needed. Would definitely recommend and hope to go back again soon. Rose, thank for your very kind words, we aim to please, so I'm glad you were happy, your welcome any time and hope to see you again soon. We loved our stay in the caravan over the bank holiday weekend! As a family with young children there was so much for them to do around the park and the pool facilities are brilliant. 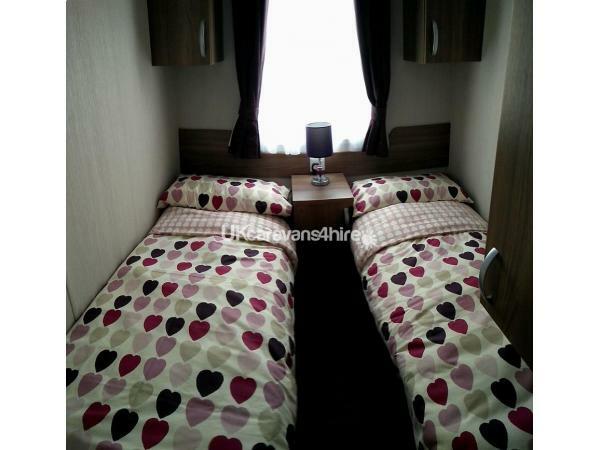 The caravan is immaculate and has lovely views of Wales. We felt it was in a perfect part of the park because it’s not too far from the facilities but far enough to be able to get away from any noise. 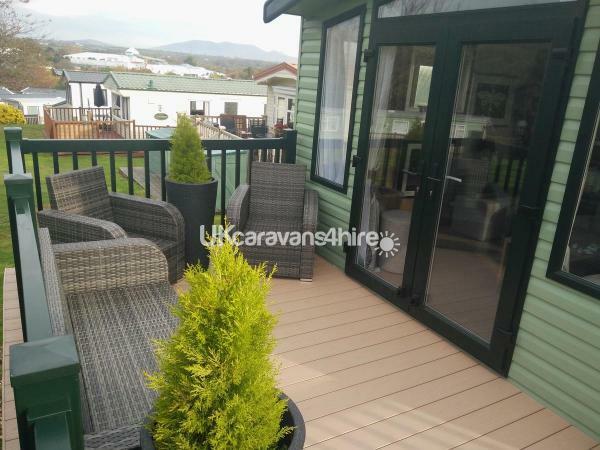 It was lovely to sit on the decking in the sun.. by far the best caravan we have stayed in and we can’t wait to go back! Thanks Tom for your comments, we are glad you enjoyed your stay, you are welcome back anytime. we had a lovely stay in this van over Easter, set in a safe/quiet part of the park close enough to center when we wanted. The van is immaculate in every way, my fav part being the decking area with seating. will definitely be back. Thanks Charlotte for your review, we would love you stay again you're welcome anytime.